KIEV, Ukraine -- The cease-fire period for fighting in Ukraine began one minute after midnight Sunday, but there are no immediate indications of whether either side in the conflict that has killed more than 5,300 people is observing it. Under an agreement struck last week, Ukrainian forces and Russian-backed separatist rebels are to begin this week pulling back their heavy weaponry to form a wide buffer zone. In a live midnight broadcast, Ukrainian President Petro Poroshenko issued the order for the country's armed forces to hold their fire. In a statement before issuing that order, Poroshenko expressed concern over risks to the cease-fire posed by the unrest that raged Saturday around the strategic government-held railway hub of Debaltseve, which is besieged by separatist forces. In an inauspicious omen for the prospects of any cessation of hostilities, rebels have said they will not consider any battles for the town to be a violation of the cease-fire. 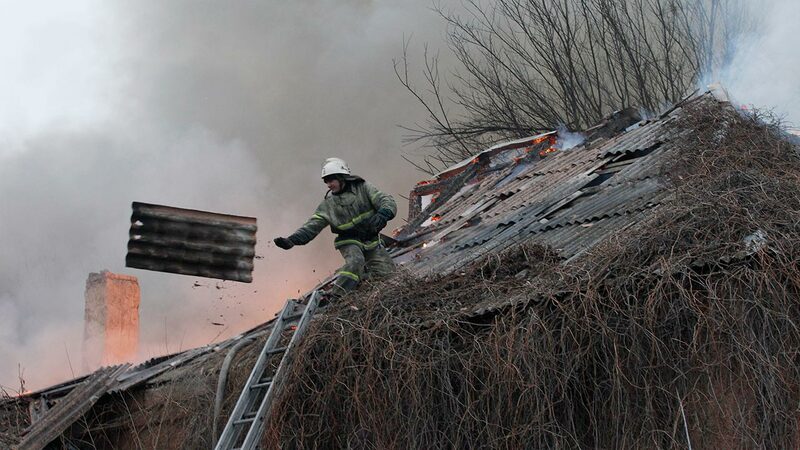 Shells rained down Saturday afternoon on the government-held town of Artemivsk, 40 kilometers (25 miles) north of Debaltseve, striking a school, which rapidly burned to the ground. Associated Press reporters also saw an artillery barrage near the government-held town of Svitlodarsk, 20 kilometers (12 miles) north of Debaltseve, as well as considerable movement of Ukrainian forces' armored vehicles and rocket launchers along the road. An undated satellite image released Saturday by the Ukrainian government showed a five-kilometer- (three-mile-)long cloud of black smoke hovering above Svitlodarsk, evidence of what it said was the scale of rebel shelling. Russia has repeatedly denied repeated Western claims that it has sent troops and equipment to the rebels. But on Saturday, the U.S. ambassador to Ukraine, Geoffrey Pyatt, posted on Twitter what he said were satellite photos showing Russian artillery systems near the town of Lomuvatka, 20 kilometers (12 miles) northeast of Debaltseve. The images could not immediately be verified. Ahead of the cease-fire deadline, statements by separatist officials cast doubt on whether fighting would end at the appointed hour. Alexander Zakharchenko, the rebel leader in the city of Donetsk, was quoted by the RIA Novosti news agency as saying his fighters would not allow Ukrainian forces to escape Debaltseve. Separatists have said the Ukrainian troops there would be offered only the opportunity to surrender. In a telephone call with Poroshenko hours before the start of the cease-fire period, President Barack Obama expressed his "deep concern about the ongoing violence, particularly in and around Debaltseve." The White House said in a statement that the two leaders "emphasized the pressing need" for all parties to implement the cease-fire and agreed to remain in contact in the coming days. Obama also spoke with German Chancellor Angela Merkel who took a lead role in negotiating the cease-fire agreement.